Fantastic 1870's Polonaise 2 piece bustle dress of a rich tan silk with blonde champagne colored lace. The bodice is trimmed around the neckline frosted bugle and white beading. 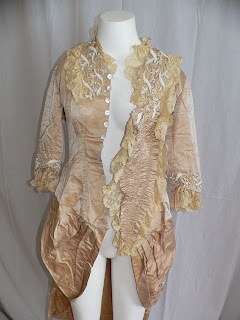 The outer neckline is trimmed with blonde lace. Across the middle of the bodice is a v shaped plastron that has beading and lace all around. It is ruched and it covers the button holes and mother of pearl buttons that closes the bodice. 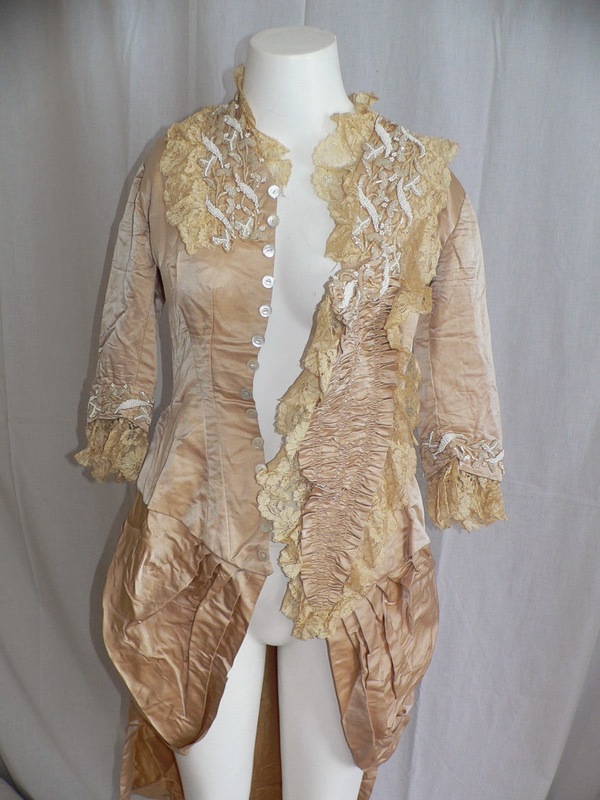 Inside bodice are 7 stays and petersham. Upper part of bodice is lined and finely tailored. 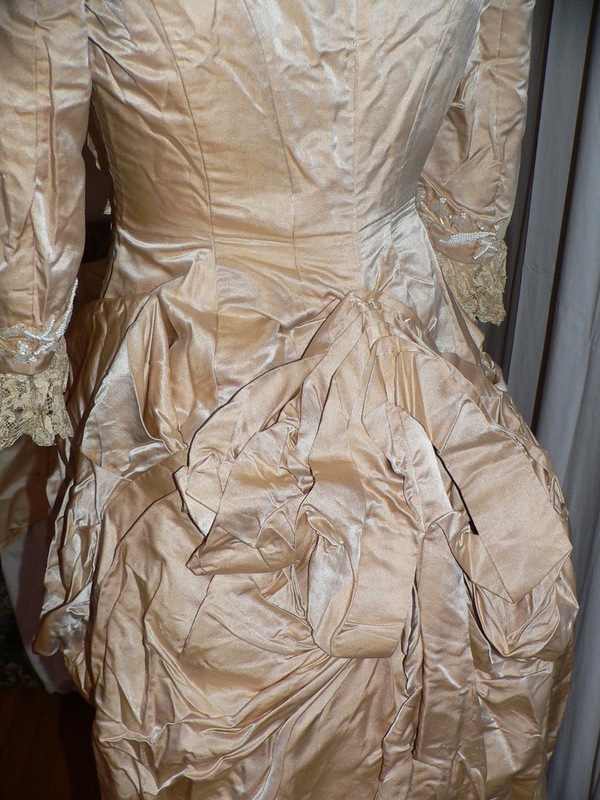 Lots or gathers to get that pannier look to lower part of bodice. 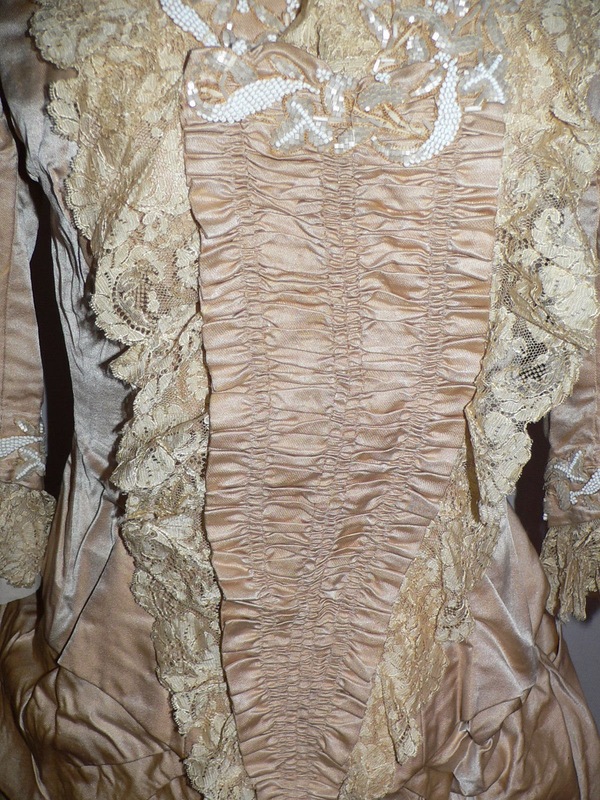 The sleeves are trimmed with beading and lace. 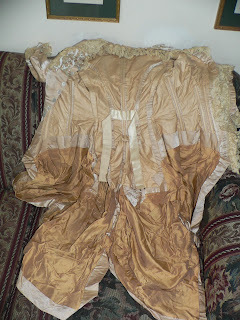 Bodice is in very good condition for age with holes in lace around the inside of neck, it seems the beading may have caused some of the lace damage as the lace folds over the beading. 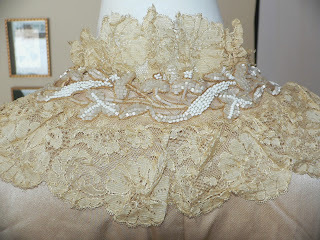 Tiny area of beading needs to be tacked - may be bead or two missing. 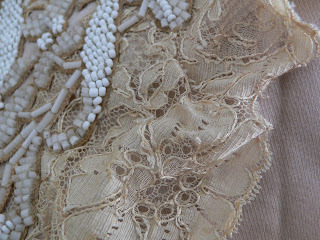 End piece of lace is torn at bottom on inside not seen and easy fix. there is under arm discoloration Couple of pin holes / scratches to silk on the bottom gathered area, not easily seen even when looking. 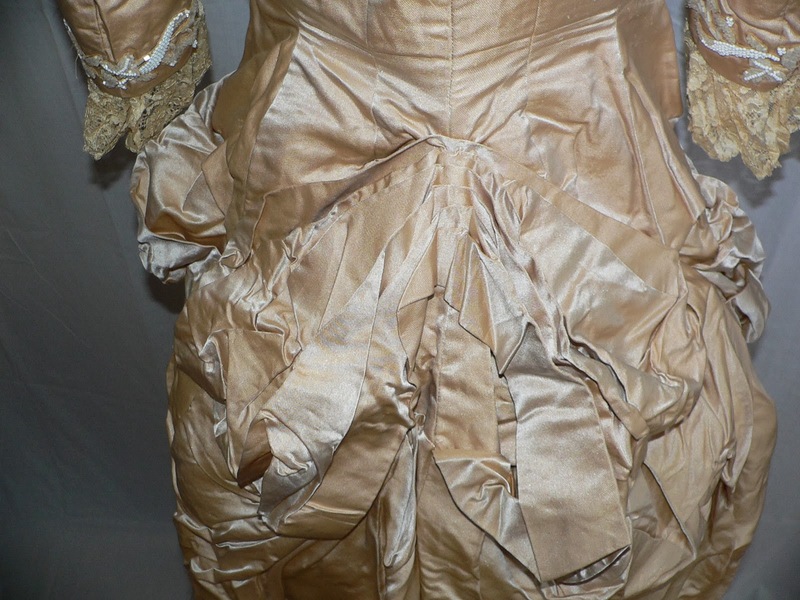 Needs eye hook to attach plastron to opposite side, I could not locate any thread loops or hook. Skirt is as lovely. I had only a bustle and no petticoat on mannequin, so front would be a bit fuller. 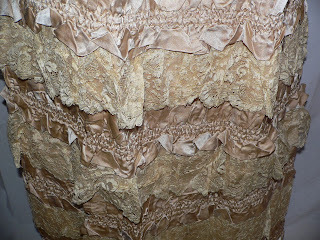 Front of skirt is rows of gathered silk alternating with the blond lace, last row of silk is pleated. It has a large eye hook for closure. The top center of back of skirt is cotton and then at bottom there is the matching silk which has 2 gathered rows and pleats at bottom. 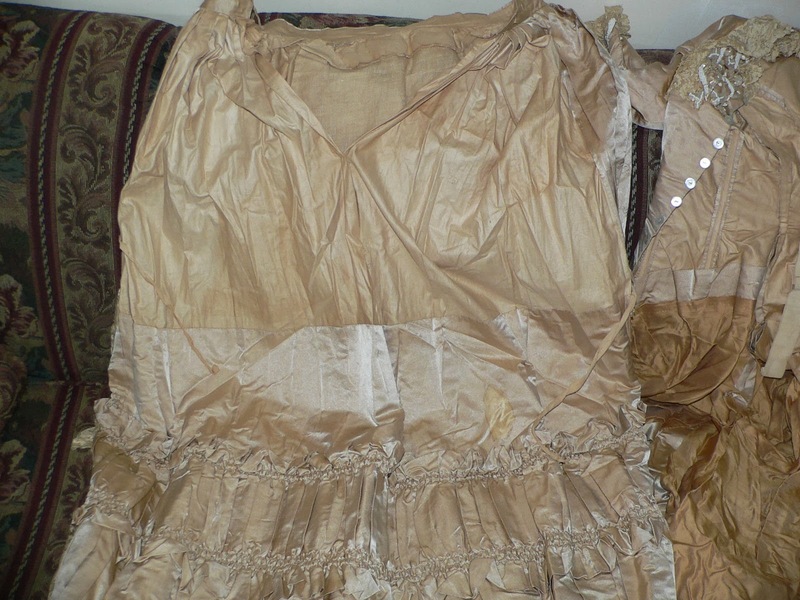 There are a couple of ties which may correspond to the inside of bustle. 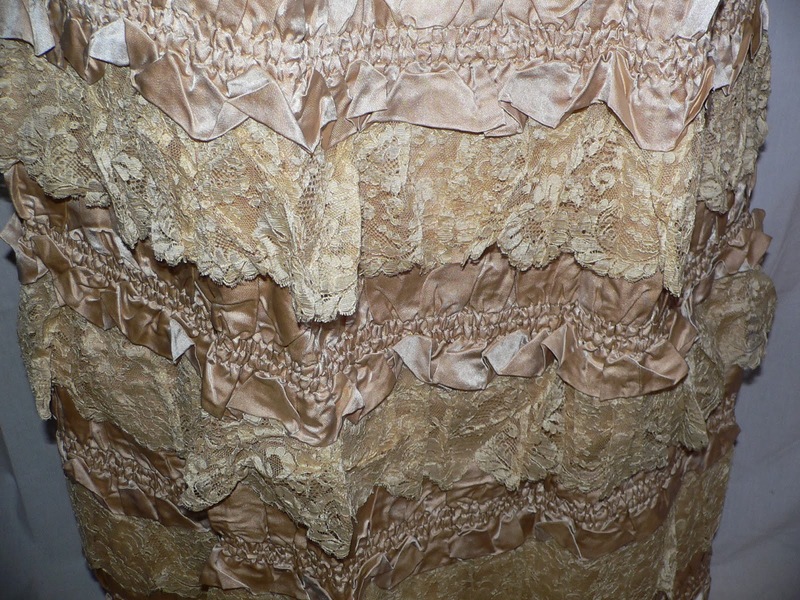 The inside of the skirt is lined with both a heavy and regular cotton. There is a covered bar with belt, I am guessing for the bustle to be held in. The bottom of lining is trim with double pleats and lace edging, very nice. 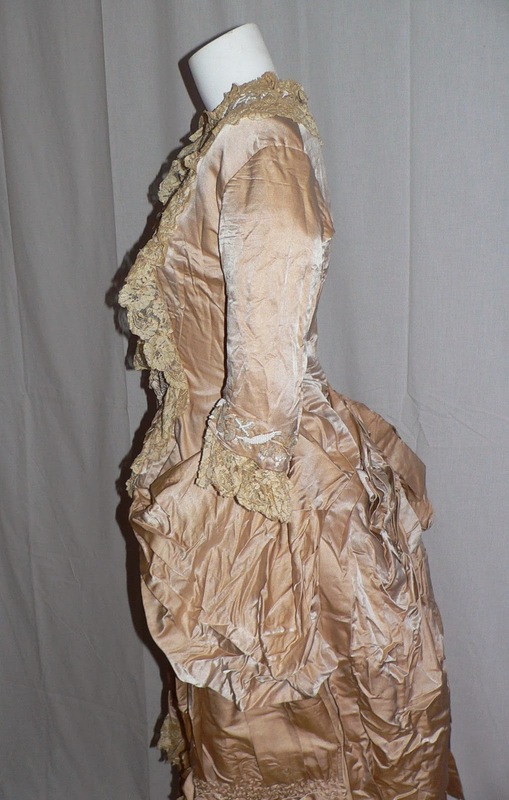 Excellent condition with a 3 x 1.5 inch spot on upper part of silk in the back that cannot be seen as the long bustle covers it. The lining lace has 2 inch tear, can be sewn up. 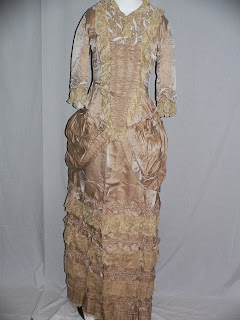 Measures bust 32 inches , waist 25 inches, length of skirt 43-44inches, sleeves length from seam + lace 15.5 inches, shoulder to shoulder across back 14 inches at drop shoulder. Please, no drool on the dress. 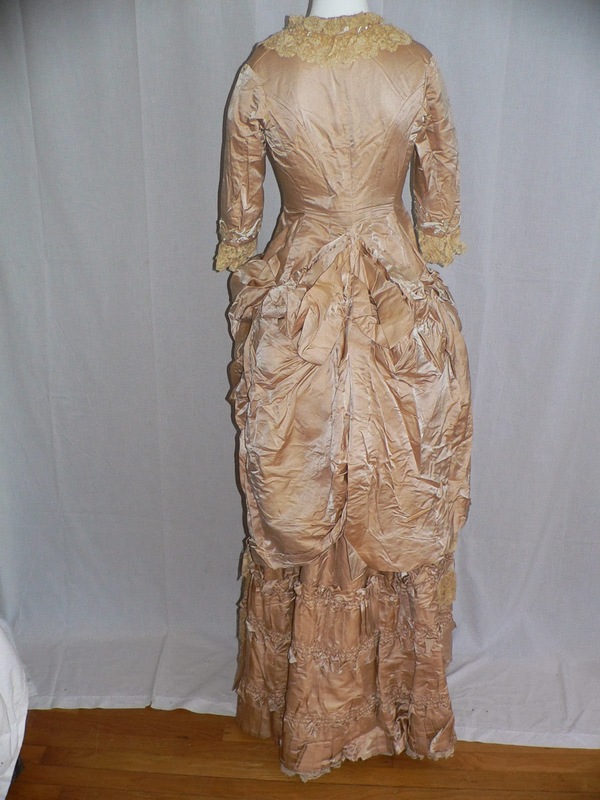 Probably about 1879/1880.